Drilling a well is not a decision to be taken lightly! Before digging a well, it is important for our team to evaluate the project in order to give you the best well based on your ground and specific needs. Our experts will need to know exactly how you will use your water in order to provide you with the best solution. Do you have a farm? A hotel? An apartment building? A single-family dwelling? All of this is important so that we can advise you properly! In addition, our experts’ evaluation will ensure the ideal location is chosen for the future well. This step is required as some rules apply to ensure the work is compliant. The well must comply with clearance standards in terms of surrounding elements. In addition, you must avoid contaminating the water table for your health as well as that of your neighbours. Because of our great knowledge of the region and the many well drillings we’ve done over dozens of years, our team knows a great deal about the terrain. Whether the ground is rocky, contains clay or has particular bedrock, our experts will recommend the best solutions for your particular situation. 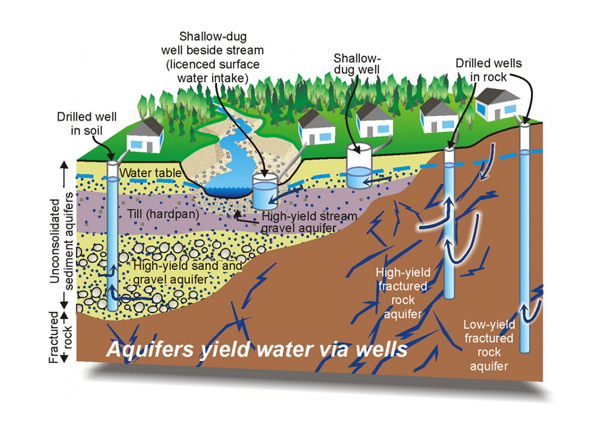 Artesian wells are known for providing better water quality. However, surface wells may be more advantageous depending on the kind of ground you have. Meet with an advisor on your land to identify your needs and the specific aspects of the sector in order to issue recommendations Note: To understand your potential water needs, see water consumption in Canada. Sign the agreements and provide the booklet “Informations on the work and the maintenance of a well.” We will also give you some tips and tricks to make your life easier and increase your comfort. After this evaluation, based on our recommendations, you will be able to choose the well that meets your needs, whether artesian or surface.